In this bike pic, we caught this biker chick pedaling her bicycle down the road into the Thursday morning sun. This picture was captured a couple weeks ago on RAGBRAI 2018. What better way to continue your 2018 riding season fun and to plan your #NextBikeAdventure. View all the great ideas and bike destinations in the latest Iowa Bike/Hike Guide or Minnesota Bike/Hike Guide. Then plan your next outing with family and friends in one of the HaveFunBiking Destinations. We are now rolling into our 12th year as a bike tourism media. As we pedal forward our goal is to continue to encourage more people to bike and have fun while we highlight all the unforgettable places you can ride. As we continue to showcase more places to have fun, we hope the photos we shoot are worth a grin. Enjoy the information and stories we have posted as you scroll through. 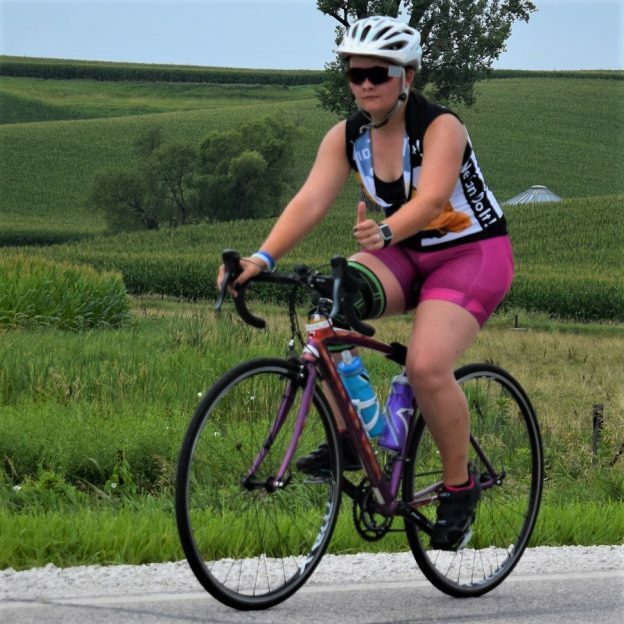 This entry was posted in Picture of the Day and tagged Across Iowa, Bike Iowa, bike touring, bike tourism, biker chick, Bosch ebike systems, e-bike, picture perfect, RAGBRAI, riding into the sun, road bike, Road bike Iowa on August 9, 2018 by Russ Lowthian.